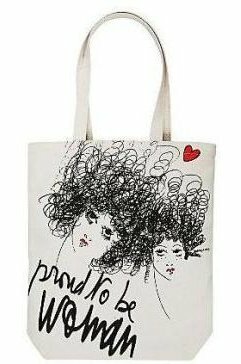 Diane von Furstenberg is celebrating International Women's Day with an exclusive tote and T-shirt collection. The limited edition products feature a bold contemporary graphic of some female faces and the positive slogan "Proud to be Woman." Aren't we all? The tote and T-shirt are affordably priced at less than $30 each. They're also guilt-free purchases, with 10% of the profits benefiting the Vital Voices Foundation. Diane von Furstenberg has a long association with the foundation, which encourages women to participate in political processes around the world. "I have yet to meet a woman who is not strong," she once said. "Women will never cease to impress me for their courage and strength, but sometimes that strength is buried so deep within ourselves, and we are afraid to let it out. It is my hope to inspire and to empower women to bring out their strength." Even if we're not political movers or shakers, we can still support the initiative by picking up one of these cute totes online.